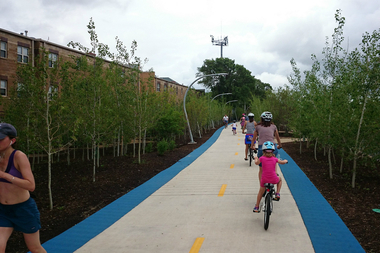 LOGAN SQUARE — Local aldermen want to curb gentrification along The 606 by making it more expensive to build homes along the trail. Ald. Joe Moreno (1st), Ald. Roberto Maldonado (26th) and Ald. Carlos Ramirez-Rosa (35th) are behind a proposed ordinance that would increase the demolition fee for residential properties along the western part of The 606 and charge a "deconversion fee" that would essentially make it more expensive to tear down multi-unit buildings and build single-family homes in their place. The aldermen, who are currently drafting the legislation with help from the Logan Square Neighborhood Association, are aiming to introduce it at the end of the month. Last month at a controversial gentrification talk, Moreno touted the ordinance as a new tool to curb gentrification. Moreno's chief of staff, Raymond Valadez, could not immediately provide details, saying the plan is still "a work in progress." Maldonado told the Tribune the measure would also "create a fund for those existing homes to be improved for home and building owners and their tenants." Since construction started on the elevated trail, home prices along the western portion — in Logan Square and Humboldt Park — have skyrocketed, according to a study conducted by the Institute for Housing Studies at DePaul University. According to the study, home prices went up 48.2 percent since the trail broke ground and residents are paying a 22.3 percent premium for properties within one-fifth of a mile of the trail, which the Institute for Housing Studies said translates into more than $100,000 of the area's average 2015 sales price. The data doesn't include rental housing stock or for-sale condos. "That's a concern for affordability for long-term residents in the neighborhood," said Geoff Smith, executive director for the Institute for Housing Studies. If the ordinance passes, it could help retain more of the neighborhood's multiunit (two-, three- and four-flat) buildings, which Smith said "tend to be an important part of the rental housing supply, especially for low-income residents." "The rents are usually cheaper because the building is older, owned by the same family for a long period of time and there aren't a lot of operating costs," Smith said. The ordinance could be the first of its kind in Chicago. Smith said he's not aware of similar legislation in the city. A spokeswoman for the The Chicago Metropolitan Agency for Planning could not immediately say if similar legislation exists.